To Sum It Up: The year is 1941, and fifteen-year-old Lina Vilkas’s most pressing concerns are writing back to her beloved cousin and applying to famed art programs. This all changes when the Soviet secret police storm into her home in Lithuania, evicting Lina and her family. The Soviets are deporting Lithuanians to Siberia, Lina’s family included, except for her father. He is separated from his family and is to be sent to a horrible Soviet prison. Lina, her mother, and her younger brother, Jonas, are left at the mercy of the Soviet soldiers. They are treated like animals: starved, overworked, and abused. Using her art, Lina strives to hold onto hope; she sends secret messages to her father in prison, uses her happy memories to keep herself sane, and does her best to keep her family and friends alive. Lina’s struggle for survival is not just for herself but for her family and friends as well. Review: Sadness. Beautiful, mesmerizing sadness. 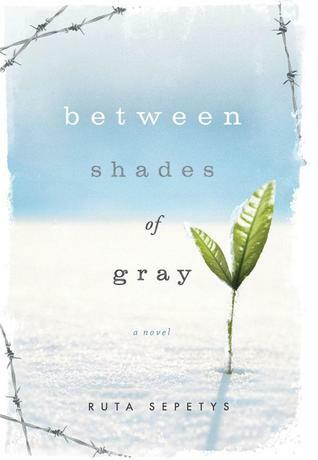 Between Shades of Gray is one of the saddest books I have ever read. And when I say sad, I mean it in the good, depressing-but-captivating sort of way. The book, I felt, was very deep. In history class, you learn about the Soviets during the WWII era, and you learn about the monstrous Joseph Stalin, but I don’t think people really understand the extent of his atrocities. Between Shades of Gray sheds some much needed light on this subject. When Lina, her mother, and younger brother are deported, they come across a small group of trusted friends. These people stick together for as long as they can and try to lighten each others’ suffering. This really touched me, and I relied on those friends as a constant in this emotional book. I was surprised to see a romantic aspect in the book. For me, it seemed to lighten the gloomy subject just a tad and gave me something to root for. Before this review comes to an end, I feel like I should mention Nikolai Kretzsky. Kretzsky is a Soviet soldier in the book, and I can’t say that I like him, but I can’t say that I dislike him either. He’s truly one of those gray characters. Out of all the characters in the book, Kretzsky seemed to stick with me the most. I won’t tell you why; you’ll just have to go and read the book. Overall, I absolutely enjoyed this book. I feel that I’m not conveying the greatness of Between Shades of Gray in my words. I urge everyone to pick up this book and read it. It’s understandable if you don’t like tearjerkers. I know I don’t, but this book is different. It just feels so real that I think that more people should know the story of Lina and her friends and family. All in All: I don’t really know what to say. Between Shades of Gray leaves me at a loss for words. And that, my friends, is no easy task. This book was just that good. I can wholeheartedly say that I loved it! Thanks! I'm glad that you're interested in reading Between Shades of Gray, it's a really good book but as you said it can be very sad.